Considering that we spend about one-third of our lives sleeping, the quality of our sleep has a big impact on the overall quality of our lives. One in three people suffers from a sleep problem, many times without even realizing it. According to a report issued by the National Commission on Sleep Disorders Research, approximately 40 million Americans suffer from a sleep disorder such as sleep apnea, restless leg syndrome, or narcolepsy. IPMC Sleep Disorders Center, under the direction of Raoul Biniaurishvili, M.D., Ph.D., brings together our friendly and professional staff and cutting-edge equipment to diagnose problems in an advanced, 4-room, sleep center. Dr. Biniaurishvili is board certified, a Diplomate of the American Board of Sleep Medicine. In IPMC, the sleeping rooms are similar to comfortable, residential bedrooms. Each sleeping room is sound and light attenuated, with individual temperature controls. Each room has a television and cable. Bathrooms, showers, and hairdryers are also available in the center. We make every effort to make sure that our rooms feel comfortable and as little like a hospital room as possible. IPMC works closely with referring physicians to conduct and evaluate sleep studies. 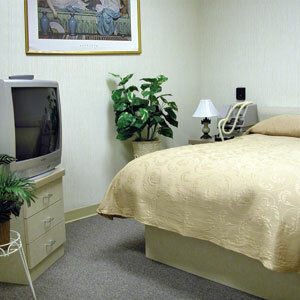 A visit to our sleep center usually requires an overnight stay in one of our private bedrooms. While patients sleep, polysomnographic technologists observe the sleep patterns in a separate room. Brain activity, breathing patterns, muscle activity, and heartbeat are monitored. The results of the tests are then forwarded to the referring physician, with recommendations for treatment when appropriate. The turnaround time for a preliminary (or technical) report is between 24 and 72 hours after the completion of the test. The final report will reach the referring physician within about week of the study date. In addition to our friendly staff and home-like environment, our center also offers free patient parking conveniently located near the front door, registration as late as 7:45 pm, transportation for elderly patients, state of the art equipment that is mobile and unobtrusive and gentle set-up techniques. We also try to minimize the discomfort of wearing electrodes by using an adhesive that quickly dissolves under warm water and will not damage your hair. All our tests are performed on the REMbrandt sleep monitoring and analysis system. At least 84 disorders of sleeping and waking lead to a lowered quality of life and reduced personal health. They endanger public safety by contributing to traffic and industrial accidents. These disorders can lead to problems falling asleep and staying asleep, difficulties staying awake or staying with a regular sleep/wake cycle, sleepwalking, bedwetting, nightmares, and other problems that interfere with sleep. Some sleep disorders can be life-threatening. Please contact IPMC Sleep Disorders Center at 215-464-3700 for more information or to schedule an appointment.